Hillary Diane Rodham Clinton /?h?l?ri da? ?æn ?r?d?m ?kl?nt?n/ (born October 26, 1947) is an American politician. She is a candidate for the Democratic nomination for President of the United States in the 2016 election. She was the 67th United States Secretary of State from 2009 to 2013. 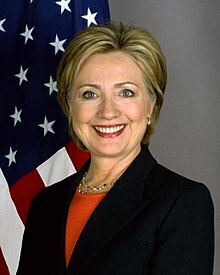 From 2001 to 2009, Clinton served as a United States Senator from New York. She is the wife of the 42nd President of the United States Bill Clinton, and was First Lady of the United States during his tenure from 1993 to 2001. In 2016, you shouldn't have to choose between succeeding at work and being there for your family. I'm a proud product of the American middle class. I want to be the best president I can be for every American. Women have to support other women. People are great across America. When families are strong, America is strong. I believe in America, and I still do. It is essential that America's word be good. Everything that happens in America happens in New York.